You & I and some blood oranges. The season is so short, and it’s nearly impossible to get these out of season, I need to enjoy them now. It’s almost embarrassing how I’ve started to hoard them. Whole Foods had a sale this week and I left with three bags. I even bought a new fruit bowl to accommodate my citrus bounty. And if you came over to my house and commented on my large bowl of blood oranges, I may or may not gush over how gorgeous they are and offer to cut one open for you. In which you would probably respond with a slight look of shock and decline my offer and very quickly change the subject. I made pavlovas as an edible fruit container of sorts. Don’t be intimidated by pavlovas, although they look difficult and impressive, they are actually very simple. As long as you make sure that not a single drop of fat (yolks or residual butter left over in a bowl) come in contact with the egg whites, they really don’t require much skill. In a small bowl, whisk together the sugar and the cornstarch. In the bowl of a stand mixer add the egg whites and pinch of salt. Beat on medium speed until soft peaks form. Turn mixer to high and slowly add the sugar mixture, continue to beat until peaks start to firm, about 1 to 2 minutes. Slowly add the vinegar and vanilla, beat until stiff peaks form and meringue is glossy. Cover a large baking sheet with parchment paper (or a Silpat). Spoon meringue onto to parchment in 4 equal sized “nests” making an indentation in each round with a spatula. Each nest should be about 2 inches across, 1 ½ inches high and have a well in the center to hold the curd. Place baking sheet in the oven and bake until the miniature pavlovas are dry and “crisp” on the outside, about 40 to 50 minutes (it's OK to open the oven during cooking to peek at the pavlovas to make sure they aren't cooking too quickly). Turn off the oven, open the oven door half way and allow the pavlovas to cool in the oven until room temperature before removing. Add the zest, blood orange juice, lemon juice, sugar, cornstarch, whole eggs and yolks to a bowl and whisk until well combined. Add the blood orange mixture to a pan over medium/low heat along with the butter. Whisk until thickened, about 10 minutes. Allow to cool to room temperature, refrigerate until ready to use (can be made up to 3 days in advance, store in an air tight container in the refrigerator until ready to use). 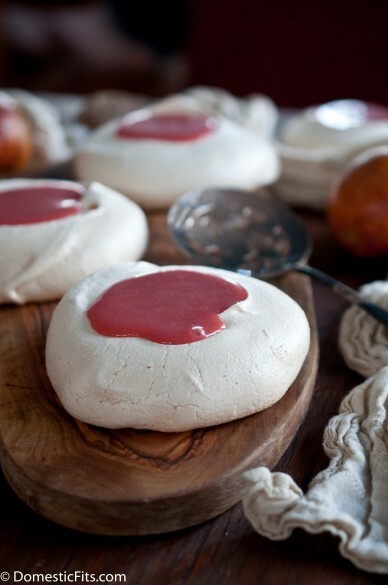 Top each pavlova with curd (as well as berries and whipped cream, if desired) just before serving. I’m jealous that your blood orange curd turned out so beautiful in color. When I made it last year and added the yolks it turned orange. Still one of my favorite curds of all time though. This looks incredible. Thanks! This is the pinkest it’s turned out for me, last time I made it, it had a brownish hue to it. But either way, still delicious! Keep the blood oranges coming. These pavlovas are stunning! 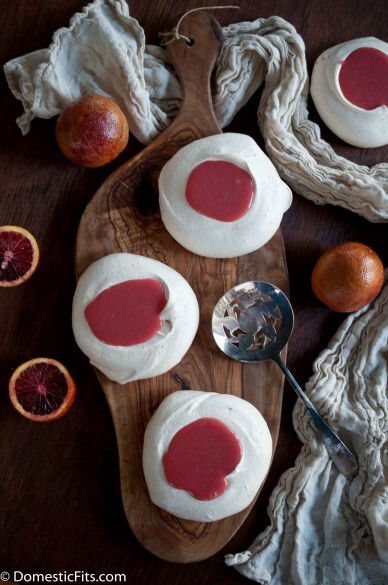 That blood orange curd – I want that on everything! It’s so good! I want to make a huge batch of it. Pavlova is a really popular dessert back in the U.K for some reason. I love it when it gets all chewy on the inside and filling these with the orange curd sounds right up my alley! Really? It’s so fun to hear what’s popular other place. I really like these for guests because they are easy to make ahead and they are so impressive. This past weekend I encountered my first blood orange and it tasted AMAZING. I also saw pavlovas for the first time. So you basically take my weekend firsts and combined them into one. You rock. This looks SO good! Blood orange curd? yes please! This sounds amazing. Can you believe I’ve never had a blood orange before?! Embarrassing, I know. I think I need to start hoarding them too and make this pavlova stat! You need to buy some! The flavor is awesome, and they go out of season soon. huuuuuuuuury! I have always wanted to make a pavlova! You can keep the blood orange recipes coming, I love it! 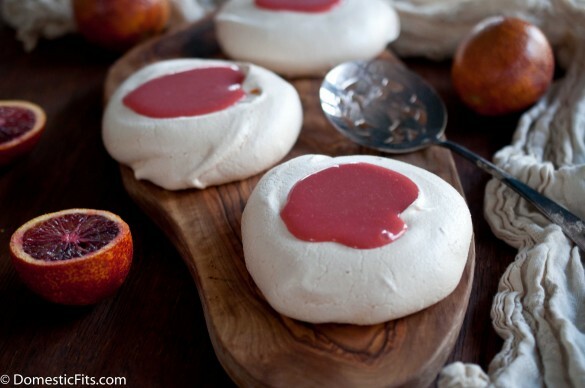 That blood orange curd is just gorgeous! Makes the pavlovas really stand out. I don’t know what a pavlova is. Is it like a meringue? It looks like dough. Delicious, blood orangey dough. Yes, it’s a meringue. It’s crispy and melt-in-your-mouth on the outside and a little marshmallow like on the inside. YUM! I love pavlovas, or really, anything involving egg whites – meringues, egg whites in cocktails, etc. These look fantastic! Blood oranges are you jam! I actually thought about you when I hoarded home 12 of them tonight! This recipe is brilliant! I just adore pavlova and anything “mini”, these look beautiful and sound heavenly. What a lovely recipe!! I can’t even imagine having such lovely fruit this time of year! You take beautiful photos! I don’t know what a pavlova is, but not I want one.